Host a Happy Thanksgiving with Fineline Settings! Thanksgiving is the biggest dinner-party in the United States; and with millions of families collecting together from one end of the country to the other, let Fineline Settings help you make it just a bit easier- and astounding! There are very few tablescape settings we decorate during the year that have quite as much impact and importance to us as our Thanksgiving table. We painstakingly polish, shine and fold: silver, china and napkins that otherwise spend their remaining 364 days in grandma’s china cabinet, all just to wash them barely a few hours later. Not to mention, the almost unavoidable risk of breakage that only adds to the stress that every host endures in preparing the perfect family event at any scale! What if you could have all of the glamour and beauty of traditional china, without the hassle of an exhausting pile of dishes, or the unpleasant possibility of damage or injury? What if you could spend every moment of your holiday with the people you love most, and virtually no time polishing silver or cleaning up after the meal is complete? Well, Fineline Settings is here to tell you that your Thanksgiving can be all of these wonderful things and more! 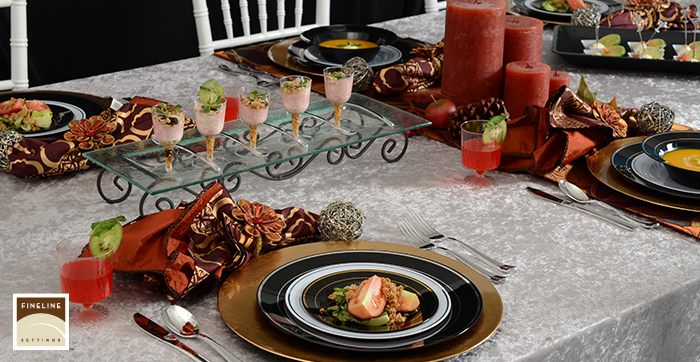 With affordable, durable, exceptionally beautiful collection lines created to serve every entertaining and catering need, your holiday will be a resounding success! Whether you want a classic table doting the elegance of our Flairware or Silver Splendor collections; or your family appreciates the modern, minimalistic style of our new Solid Squares or Wavetrends collections; we have styles and colors to match your holiday tastes! 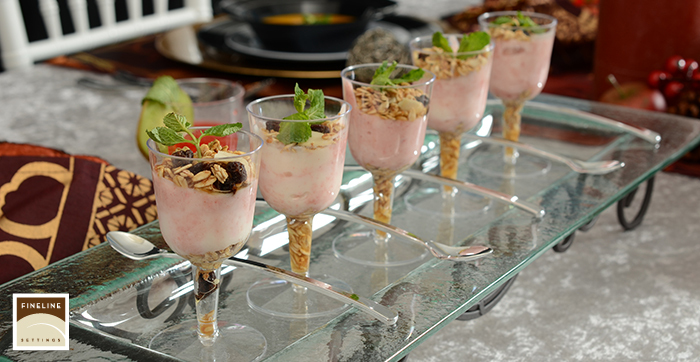 No matter your plates and bowls, our beautiful cutlery will compliment every setting. 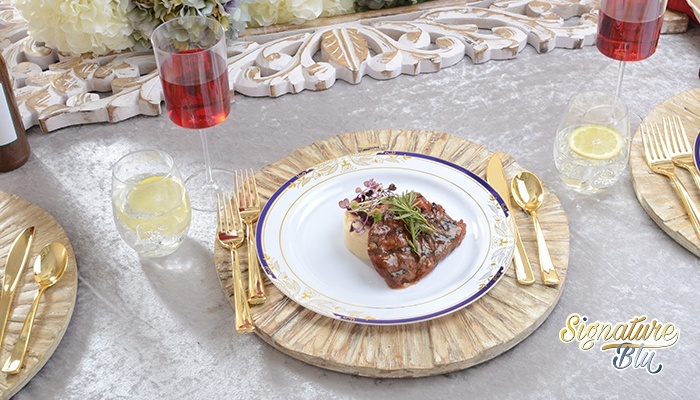 From the classic sheen of our silver-finished Silver Secrets cutlery, to our new and exclusive line of Gold Cutlery, every place setting will glint with elegance and ease! When it comes to serving up your bird and the accouterments, our Platter Pleasers collection has every course covered from Bowls, Platters, Gravy Boats, Pitchers and Buckets- even Lids to help preserve the perfect holiday leftover! As we said earlier, this day of thanks is just one day out of the year that our Fineline family cannot pass up in letting you know just how much you mean to us! We’re so thrilled to spend another Thanksgiving at your holiday table, and we look forward to many more! Take these next holiday months to show those that mean most to you just how special they are. Slow down from the chaos of day to day stresses so that you never pass up a hug, a laugh or a toast with those people who make your life so fulfilling! We hope that you and yours have a fantastic, safe holiday season! Gather Around The Table This Thanksgiving With Fineline Settings! Most of us start planning this Holiday even before we pick out our Halloween costumes. A holiday that originated hundreds of years ago between two vastly different cultures has remained one of the biggest holidays in our country. A tradition bringing families together across the country regardless of distance or time. With barely two weeks left until Thanksgiving, we here at Fineline Settings have been looking forward to helping you celebrate in FLS style all year! This year we’ll be taking your concepts of what Thanksgiving feasting is all about and turning them on their head! We’ll share with you the most classic of holiday dishes and also help bring out your inner maverick with some menu ideas that will have you and your guests gobbling up their meals this year! Along with the awesome recipes we’ve collected; we’ve got a fabulous selection of some of our products that will compliment your holiday table whether you stay classically chic, or edgily distinct! Have a look at what we’ve got to help make your Thanksgiving get together all in the family and OUT of the sink! There’s no better collection to highlight your traditional Thanksgiving celebration than Silver Splendor. With three styles, multiple sizes, and color combinations to choose from, your family will be smiling with delight as they dine on disposable dinnerware that is as distinct and classic as fine china. 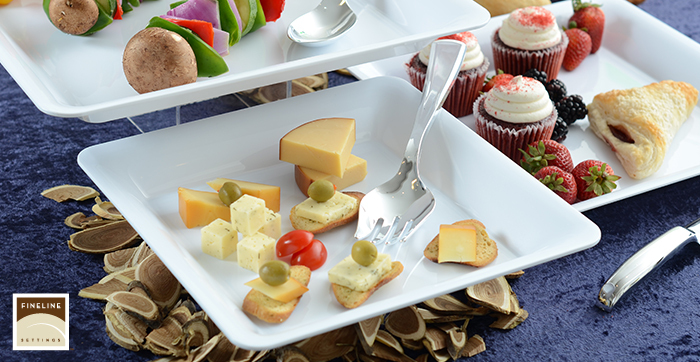 Complete your tablescape with our Silver Secrets Cutlery to keep your classy affair consistent! If you’re looking to keep your Thanksgiving holiday event more about the mingle, and you don’t want to keep everyone confided to seating arrangements that are rarely abided; or maybe you want to avoid screaming across the table to have the green bean casserole passed; regardless, why not let your guests chat and delight with our Tiny Temptations Appetizer Trays and Tiny Barware? Let your guests graze and be amazed at this unique approach to Turkey Day! No matter how you want your guests to dine on dinner, never forget that our Platter Pleasers Collection will have everything you need to serve up your entire menu with ease, elegance, and affordability! You’ll finally get the chance to enjoy your holiday in all of its glory, without running about scraping the cranberry sauce from the plates and washing platters until deep into the night… especially when there is Black Friday Shopping preparations to be made! We’ve given you your canvas, so let’s discuss your paint. Below is our carefully selected menu ideas that will make this Thanksgiving like nothing your grandma has ever seen before! We’ll be showcasing your favorite classics, healthy options to help keep yourself fit this year, and anything else we could find to just make November 27th easier for you! Let’s have a look! We’ll start off with some tried and true staples slimmed down to keep your waistline in check and your pants zipped up! Our friend, Chef Meg, has come up with “A Dozen Trim Thanksgiving Recipes”, over at the health site: SparkPeople.com. With recipes like “Pumpkin Dip”, “Sweet Potato Tarts”, and “Apple Cider Gravy”, your next Thanksgiving will have all the flavor without the fat! We know that what we’re about to suggest may be taboo to some of you and a godsend to others. Have you ever considered a… Vegetarian Thanksgiving? Hold on, stop for a second before you laugh. Turkey may be synonymous with Thanksgiving, but most of the other dishes we have at the table are, in fact, fruit and vegetable based if we really stop to think about it: Mashed potatoes, Green bean casseroles, Cranberry sauce … The list goes on and on! Maybe we should give this idea a bit more thought? Angela, over at her blog: oh she glows, is here to show us just how easy and delicious veggie Thanksgiving can be! Her array of enchanting and delectable vegetarian recipes. 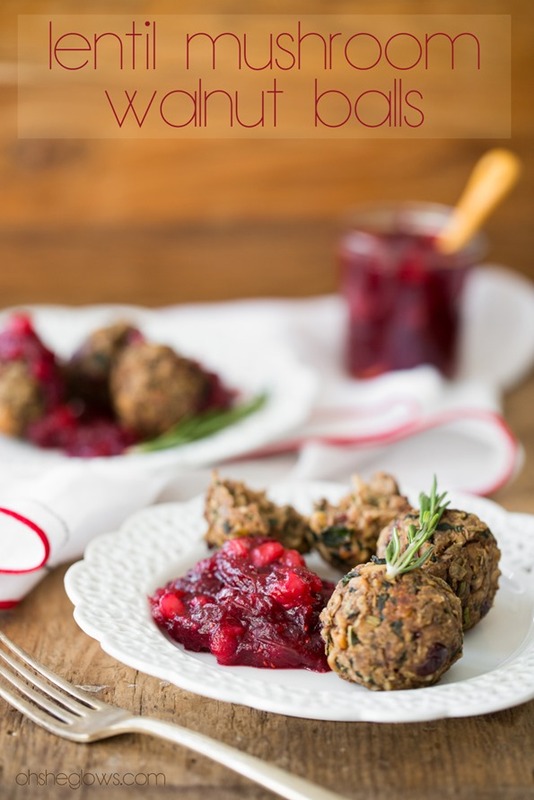 Crispy Smashed Potatoes with Avocado Garlic Aioli, Lentil Mushroom Walnut Balls with Cranberry-Pear Sauce, and Gooey Pumpkin Spice Latte Chocolate Pudding Cake are just a few of the incredible dishes that could high-light your table this year- and all vegetarian friendly! We saved the traditional for last, but certainly not least. For those of us who want the Thanksgiving that we’ve recalled since our childhood; filled with all of the dishes that grandma and Aunt Arlene prepared for hours; our friend, Elise, has got the recipes for you. On her blog, Simply Recipes, she leaves out all of the fuss and muss and gets right down to good, old-fashioned holiday cooking with little twinges of flair that will keep everything you love about the classic Thanksgiving recipes, and add that extra little spark you will wonder how you lived without! Apple Cranberry Pie, Bourbon Mashed Sweet Potatoes, and Cranberry Apple Sauce barely even scratch the surface of what Elise has to show you to wow your guests for years to come! This has been one of our more bulky blog posts as of late, but we knew that there was just too many awesome things to talk about to leave anything out! We’re so excited to see how you host your holiday, and we hope that our array of outlets will help you check off your list this year! We hope that you have a most wonderful Thanksgiving weekend with your family and friends, and we’ll see you back here Monday!